Starfire’s average penetration of 9–14 inches translates to more energy expended on the target and less wasted on landscape downrange. 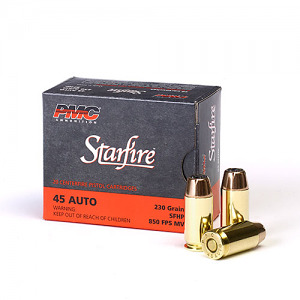 Created by a patented rib and flute design inside the deep, hollow-point cavity, the bullet hyper-expands to nearly twice its original diameter upon impact, delivering tremendous stopping power on target. Getting within range of big game with a handgun takes considerable effort and skill. When you get there, you need to have confidence that your ammunition is going to get the job done accurately, powerfully and reliably. Starfire earns perfect scores in all three criteria.